Standing Together, a new joint Arab-Jewish movement, is aiming to transform Israeli politics. It won’t be easy, but the Israeli left’s first step back to power might be believing that it can win again. The Israeli left is in the midst of an historic crisis. Out of power for over 20 years (with the exception of Ehud Barak’s brief and fractious stint as prime minster), Labor is now headed by a millionaire telecommunications executive who once served as a minister under Netanyahu. Meretz, the dovish, social-democratic party, barely made it into the Knesset in 2015. The peace camp is fractured and leaderless. Peace Now’s promising, young new director, Avi Buskila, resigned after barely a year and a half to seek the leadership of Meretz — he lost. A new crop of centrist parties — the strongest electoral challengers to Netanyahu — have mostly turned out to be Netanyahu-lite. Into this howling political void, a new, left-wing movement called Omdim Beyachad (Standing Together) has emerged. The movement has begun to succeed where others faltered, drawing on the strategies and lessons of successful left-wing populist movements around the world. The movement is young — it first appeared in late 2015 — but it has been steadily growing in size and influence. Standing Together activists hope to make the movement into the guiding force of the Israeli left. Standing Together activists are now preparing to protest Israel’s impending demolition of the Bedouin village of Umm al-Hiran in the Negev. A Jews-only town is slated to be built on the village’s ruins. At 30, Green is an experienced political operative. A labor activist who became a prominent face of the 2011 social protests, he is a member of the Israeli Communist Party and Hadash, the Arab-Jewish socialist alliance that is now a part of the Joint List in the Knesset. 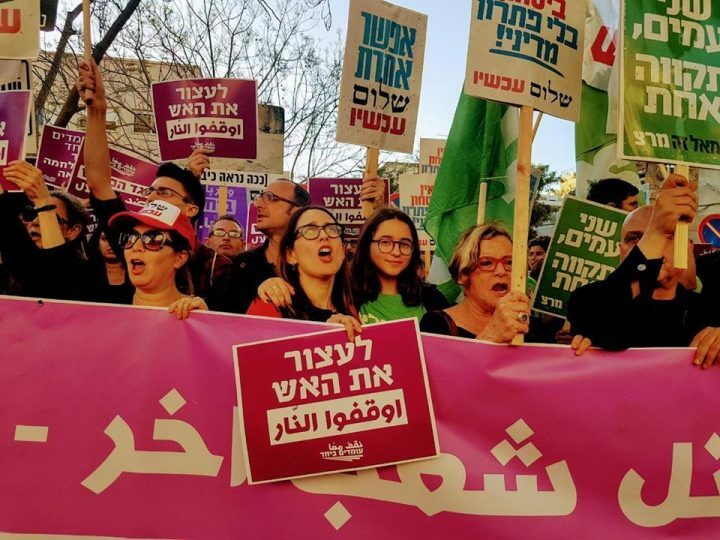 Founded in late 2015 by alumni of the 2011 social protests (Israel’s version of Occupy), young Communist party members, and other veteran left-wing activists, Standing Together — identifiable by its signature purple paraphernalia — has, over the past year or two, become ubiquitous at protests around the country: against evictions in East Jerusalem, home demolitions in the Negev, anti-Arab racism in the north, and against Israel’s plan to deport tens of thousands of Eritrean and Sudanese refugees. Bigelman, 29, is a public policy Master’s student at Hebrew University who spent six years working at the Israeli anti-occupation NGO Breaking the Silence. He is also a member of Meretz, adding some party diversity to an otherwise Hadash-heavy leadership. While the movement may have identified a void in Israeli politics, it seems unsure of exactly how to fill it — how to reach people at the grassroots level and what to do with them once they are activated. The party structure, which has historically dominated Israeli politics, can no longer mobilize large numbers of people. Human rights NGOs and civil society organizations have become the de facto backbone of the Israeli left and peace camp in recent years, especially in the absence of an effective parliamentary opposition. But NGOs are not mass movements. Standing Together activists know this, and cite a wide range models they say they’re learning from: Podemos, the Spanish left-wing populist party; Momentum, the pressure group inside the British Labour Party; Syriza, the left-wing Greek anti-austerity party that rose to power in 2015; the Democratic Socialists of America; the American community organizing tradition; even the right-wing settler movement Gush Emumin (in Hebrew, the Bloc of Believers). But all of these models are different and even somewhat contradictory. Half are parties or groupings within political parties, which Standing Together’s activists and leaders adamantly insist they have no intention of becoming. Standing Together activists’ admiration for Podemos and British Labor Leader Jeremy Corbyn’s brand of politics, however, is clear. Podemos’s color, like that of Standing Together, is purple. And activists sometimes literally translate Corbynite slogans — like “for the many, not the few” — into Hebrew in their speeches. This affinity makes sense. Around the world, support for the old social-democratic parties has collapsed; Israel is no exception. Parties like Podemos have replaced the old, discredited social-democratic by adopting an “agonistic” and majoritarian approach, drawing on a shared theoretical orientation (in particular the work of Belgian political theorist Chantal Mouffe and her late partner, Ernesto Laclau). These parties are agonistic in the sense that they name their political enemies. They are majoritarian in that they situate “the people,” the majority, in opposition to a small, privileged, exploitative class of elites. Bringing this kind of politics, to Israel, at least on the level of messaging, requires only minor translation work. Learning from the American political organizing tradition will be more difficult. Rules for Radicals, the organizing handbook by the legendary Jewish organizer Saul Alinsky, which opens with a quote from Hillel the Elder, has never been fully translated into Hebrew. The same is true of the work of Gene Sharp, the scholar of nonviolent protest who died in January. The bulk of community organizing literature, as well as literature in the burgeoning field of civil resistance, remains largely unavailable to Israeli readers. To compensate, the movement has invited students of Marshal Ganz, the community organizing guru credited with engineering Barak Obama’s presidential campaign, to speak to its members. But the most adaptable model for Standing Together — and one which would require less translation — might, paradoxically, be the settler movement Gush Emunim. “I think about Gush Emunim as a massive political movement that wasn’t a party, but which shifted the entire political map further to the right,” Bigelman tells me. What might be called the Gush Emunim approach, acting as a force that can pull the political parties in one direction, was on display at the protest outside of the Likud headquarters last week. Leaders from Meretz and Hadash gave speeches or simply were present; some Labor party activists even showed up. But the tone of the protest, the chants and the majority of the signs — those belonged to Standing Together. The movement’s greatest asset is perhaps also its greatest challenge. Standing Together is a joint Arab-Jewish movement. All of its materials — on Facebook, on protest signs — appear in Hebrew and Arabic. The movement’s leadership and rank-and-file includes Israeli Jews and Palestinian citizens of Israel. It boasts of a level of Arab-Jewish joint political engagement that hardly any of the political parties, except maybe for Hadash, approach. “The movement isn’t sitting in Tel Aviv and talking about Taibeh,” Nisreen Shehada, a member of the national steering committee, assures me. Shehada, who has a PhD in chemical engineering and nanotechnology, works at a large high-tech company and lives in Haifa. In contrast to both Green and Bigelman, she says she has never been engaged in party politics — like many of the movement’s new activists. Standing Together has nine circles — what the movement calls chapters — located across the country: in the Sharon and the Triangle (an area of Jewish and Arab communities in the north); in the Negev, where much of the movement’s energies are focused on the unrecognized Bedouin communities; in Haifa; in Tel Aviv; in Jerusalem; and at the Tel Aviv, Ben Gurion, Haifa, and Hebrew universities. Not all of the circles, though, are models of joint politics. In Jerusalem, for example, the membership reflects the reality of life in the segregated city, where Palestinians are not citizens and generally boycott municipal politics; the majority of the circle’s activists are Jews. To win mass support in a majority Jewish country, the movement knows it will have to somehow transcend the segregated nature of Israeli politics, especially as racism and right-wing violence are on the rise. It remains to be seen whether the European kind of left-populism can be made to fit Israel, where there is no real national-civic identity to speak of that could be embraced by both Arabs and Jews. Israeli Jews, including those who define themselves as left-wing, have long refused to see Palestinians citizens of Israel as potential partners. Avi Gabbay, the Labor Party’s new leader, exemplified this mindset last October when he declared that Labor would not join a hypothetical government with the Joint List, the heterogeneous coalition of Arab-led parties. “We have nothing in common with them,” he said. Standing Together will have to convince the Jewish public otherwise. Standing Together’s activists have their eyes on transformative change. Their goal: a mass movement of Arabs and Jews that opposes neoliberalism as well as the occupation, that fights for LGBT and women’s rights as well as full equality for Palestinian citizens of Israel. In the depths of the third Netanyahu government, to call this ambitious feels like an understatement. And yet, in addition to European political theory and American organizing models, the movement has insisted on bringing to the Israeli left something it has lacked for a very long time: hope. If the movement has a motto, it is “Where there is struggle there is hope,” which it has emblazoned on signs, banners, and tote-bags (the bags also bear Martin Luther King Jr’s face). The Israeli left has been out of power for so long that it has grown accustomed to losing — believing that it can win may be the first step back to power. At Standing Together’s first national assembly, held in an acting studio in Jaffa, Dov Khenin, the veteran Jewish Hadash politician, angling to be a kind of Israeli Bernie Sanders as of late, walked up to another older man I’d been talking to. “What do you think, Dov?” the older man asked.